Created fairly recently (2005), Ojito is one of New Mexico's lesser known wilderness regions, occupying 11,000 acres of the high desert west of San Ysidro, bordering the Zia Indian Reservation. 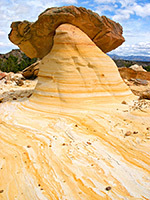 This part of the state lies right at the edge of the Colorado Plateau, a vast area of layered sandstone rocks of different colors, and as with other nearby sections also protected as wilderness such as Ah-Shi-Sle-Pah, Bisti and De-Na-Zin, Ojito features beautiful eroded rock formations including hoodoos, caprocks, cliffs and solidified dunes, together with petrified wood and other fossils, plus occasional petroglyphs and ancient ruins. Unlike the more well known areas further northwest (all within the San Juan Basin), the Ojito Wilderness is more overgrown and less remarkable at first sight, as the interesting locations are generally small, isolated and take some effort to find - most of the region is a rather nondescript mixture of bushy flats, twisting ravines and low mesas, not much different to the land at either side, which is similar in appearance for a hundred miles or more in some directions. 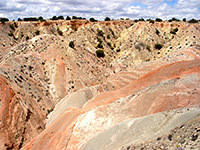 Perhaps the single most impressive site in the locality is just outside the wilderness - the San Ysidro Anticline, where the sandstone strata have been pushed up to create a 3 mile long band of colorful ridges and ravines. The one entrance route (Cabezon Road, CR 906) to the wilderness forks west off US 550, 2.5 miles south of the Hwy 4 junction in San Ysidro and 35 miles north of Albuquerque. The road, which is signed to Ojito, is unpaved but wide and generally smooth, with just a few sandy or bumpy spots, and is kept in a good state of repair by the oil and mining companies who operate in the neighborhood. The track soon passes an industrial site then turns south and later west, briefly crossing the Zia Reservation, before reaching a BLM sign announcing the start of public lands, just after a fence and cattle grid (4 miles from the highway). The anticline is passed on the right, followed half a mile beyond by a turning to a mountain bike trail area on White Mesa, and then, after another 5 miles across the wide open landscape, the road nears the wilderness area, running along the south edge; access is by cross-country hiking to wherever looks interesting, though there are two official trailheads. Free primitive camping is allowed anywhere in the area. 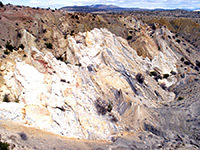 The first destination along Cabezon Road is the San Ysidro Anticline (also known as the Tierra Amarilla Anticline), where strata of the Summerville, Morrison and Dakota Formations are upturned by 60° or more, forming a series of jagged, parallel ridges of sandstone and other rocks, of greatly contrasting colors including brown, black, green, red, yellow, and, most strikingly, pure white. From a signed parking area on the north side of the road, a short trail follows an old vehicle track into the middle of the jumbled strata, and a narrower path climbs steeply to the top, at the edge of a plateau, and links with one of the adjacent White Mesa bike trails. The higher vantage points have excellent views eastwards, over the ridges and the flat desert beyond, to the distant Jemez Mountains (see panorama). 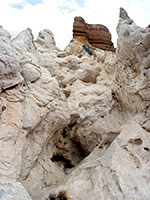 The Ojito Wilderness is reached after a 9.5 mile drive from US 550, after which the track continues beside the southern boundary for the next 3 miles. 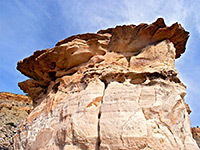 Cross-country walking is fairly easy, over the generally flat land between the mesas, but most visitors follow one or both of two recognized routes. First (10 miles from the highway) is a 0.7 mile path down a long disused vehicle track to the edge of a steep-sided escarpment overlooking Arroyo Bernalillito at the center of the wilderness - not an especially interesting scene, though this location is famous because of a huge dinosaur skeleton excavated here - of a seismosaurus. The second, one mile further, is much better; beginning at a small parking area on the north side of the road, quite a well marked path crosses some open, cactus-covered ground then runs beneath the east face of Bernalillito Mesa, gaining height gradually and ending at a viewpoint on the north edge, also looking out over the wash to the badlands beyond. 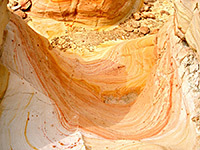 En route are a number of localized but pretty erosional features, most striking being a beautiful outcrop of teepee-shaped mounds of yellow Dakota sandstone, crossed by thin, delicate pinkish-red layers. One U-shaped passage between two of the cones is reminiscent of the Wave in Arizona. This location is just 0.5 miles from the trailhead, slightly west of the path; not far beyond is a nice group of flat-topped hoodoos, mixed with large ponderosa pine trees, a rare species in this generally arid environment. Rocks in the cliffs higher up also have nice colors and forms, and other small pockets of hoodoos (and petrified wood) can be found all around the mesa. A round trip on the first trail, down the side of the escarpment and across to the top of Bernalillito Mesa, south along the second trail then back via the road, takes from 2 to 3 hours. The nearest large towns with hotels close to the Ojito Wilderness are Bernalillo (33 miles), Rio Rancho (35 miles) and Albuquerque (35 miles).